A New Russian Foreign Policy? Vice-president, Centre for Political Technologies. Opinions today about Gorbachev's foreign policy are contradictory. Certainly, no modern leader has walked so many extra miles to meet the West as did Gorbachev, if only to avoid losing both popularity and power, as happened to him. 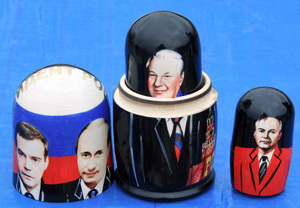 And it should be noted that Medvedev's rise in no way implies Putin's decline. He is the head of the government and, under the Russian constitution, will have a say in the making of foreign policy. According to Article 112, Part 2 - until now a largely formal article, but now invested with full content - the Prime Minister submits to the President the candidates of all the ministers, including the Foreign Minister. Furthermore, the government "takes measures to ensure the defense of the country, state security, and the implementation of the foreign policy of the Russian Federation" (Article 114, Part 1). A strong and politically influential head of government will ensure the continuity of foreign policy and guarantee the evolutionary character of any change. Besides, there are real national interests that any Russian leadership will follow. No Russian leader will renounce support for Abkhazia and South Ossetia, agree to the independence of Kosovo until the legitimate Serbian authorities agree to it, or approve Nato's integration of Ukraine and Georgia. We should speak not about a revision of the foundations, but rather a change in the style and some of the components of a foreign policy which is already becoming more rational. Russia and the U.S. started a dialogue on the deployment of the American missile defense system in Central Europe as early as last year. The current complications in Russian-Georgian relations have not led to economic measures against Georgia, as happened in 2006. On the contrary, some restrictions have been removed while others may be lifted soon. It is now hard to imagine pro-government youth organizations staging actions in the center of Moscow similar to the "blockade" of the Estonian embassy during the crisis connected with the shifting of the Bronze Soldier memorial in Tallinn. There is a chance that Russian-British relations may improve: the two countries' leaders are to meet during the G8 summit.